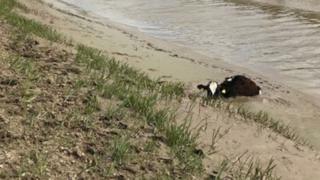 A cow had to be winched free after getting itself trapped almost up to its nose in deep mud. Specialist water rescuers used winches and a teleporter to lift the stricken calf free from the river bank in Thorney, Cambridgeshire. Three crews from Cambridgeshire Fire and Rescue Service were involved in the three-hour rescue at about 12:15 BST on Sunday. The calf was safely returned to a farmer and checked over by a vet.